Well, real fishing, sat on a river bank for hours on end with a fishing pole, is pretty sad, but this has to be the daftest / saddest thing I have done. Virtual fishing. Basically, someone wants help starting to play WoW, so I am helping. But I don't want to get to far ahead. And I was kind of expecting him to log on. So while waiting I had my character fishing as it does not get you any XP and means I am not racing ahead of him. Well, spending over an hour virtual fishing is just sad. I must be mad. I should get my head examined - no, wait, I already did that. P.S. Apparently I have the achievement [250 Fish]. Arrrg! Shoot me now. P.P.S. 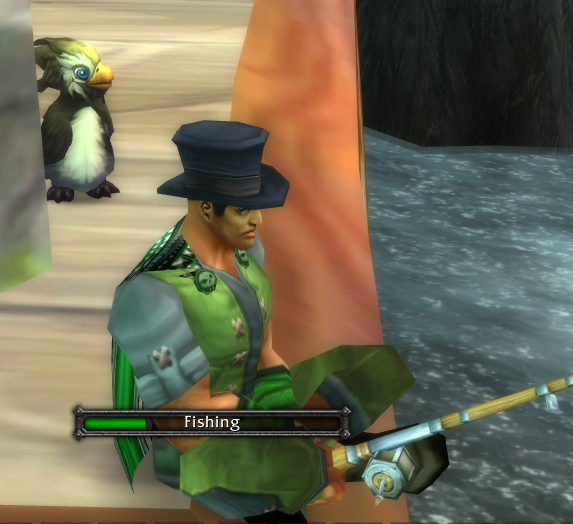 Yes, that is my pet penguin - you have to do something to relieve the boredom. Will UK Computer Misuse Act get as bad?